Hello everyone, hope you're all doing well. Went skiing at Bretton Woods, NH this weekend. 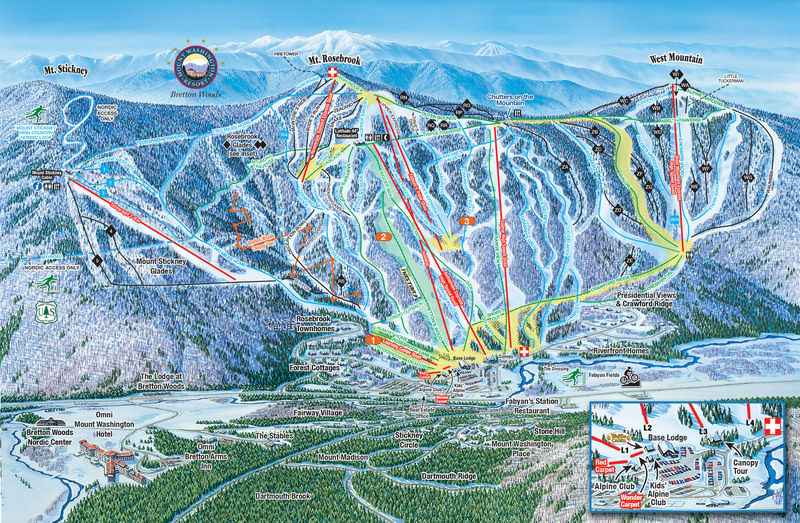 They have a base-to-summit Gondola in the works for the Mount Rosebrook side of the mountain. The B-chair (70's Heron Double) has been removed. Presumably Another Footing Covered In Snow (I'm just going off the orange ropes) Supposedly, this quad is staying in. Doesn't that tower look like it's a bit close? May be perspective. They claim the lift will be capable of 4.9 minute ride times (!!!) [read : Bethlehem express is shorter, and 6.5 minutes] and over 13 mph (1,144 feet/minute) My guess is that won't be the final operating speed, doesn't make a lot of sense to run that fast every day. I am surprised that the Bethlehem Express is staying in, I figured it would be replaced by the gondola. My guess is it'll probably still operate on weekends.